Alexandra Rowland grew up on a sailboat in the Caribbean and then in a house in Florida. Sick to death of the tropics, she attended Truman State University in northern Missouri, where she studied world literature, mythology, and folklore. She now lives in western Massachusetts where she works as a game monitor at an escape room company, occasional bespoke seamstress, and writer under the stern supervision of her feline quality control manager. She can be found on Twitter as @_AlexRowland. 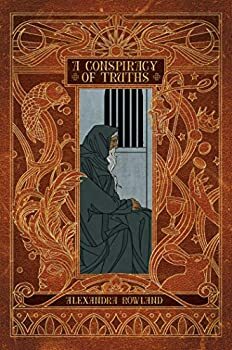 A Conspiracy of Truths is her debut novel. Marion: We never know the name of our first-person narrator in Alexandra Rowland’s 2018 novel A Conspiracy of Truths. People call him Chant, but that is his vocation, not a name (he abandoned his name when he became a Chant). Chants gather stories and retell them. They go from place to place pursuing their craft, and in the isolated and insular country of Nuryevet, Chants offends the wrong people, and is put on trial for witchcraft.